I am on a ready-to wear fast for 2015, (hosted by Goodbye Valentino) participating in another year of refraining from buying manufactured clothing. Although underwear is allowed, I delved into the world of luxury lingerie. Carine Gilson creates the most exquisite lingerie in Belgium. Pieces are made one at a time by artisans with prices to match. The Carine Gilson site has a button on the right for either French or English. Look under the “News” section and on the far right will be a video of her working in the atelier. The line can be purchased at Nancy Meyer or you can just drool over the selections. Purchasing these creations would probably blow anyone’s clothing budget for years. My first clone is a simple bias cut chemise which can be either a slip or nightgown. Bias techniques are from those used by Madeline Vionnet and explained in the book by Betty Kirk. 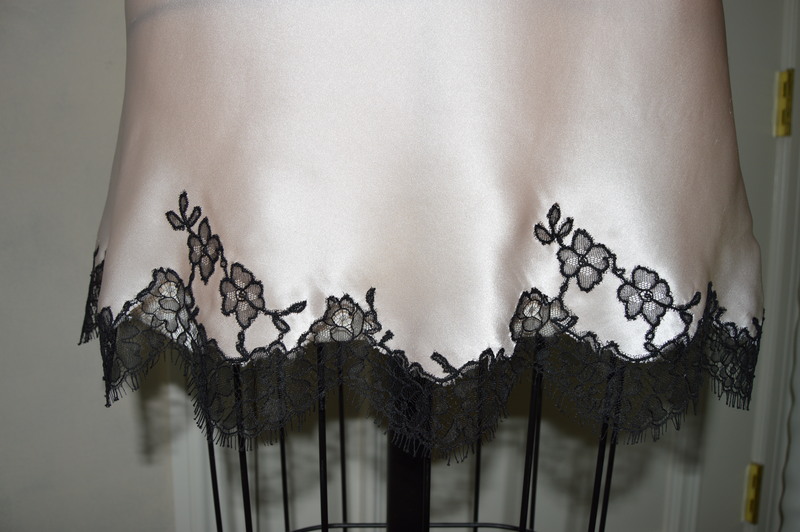 The fabric is silk charmeuse and the lace is a French chantilly, both from B&J Fabrics. Cut garment sections on the true bias allowing generous side seam allowances. The sections will stretch in length so don’t worry about extra at the hem. The side seams will narrow considerably, so allow at least 2 inches for seams. I stay stitched the neck and armholes and draped on the dress form. The secret to Voinnet’s garments holding their shape over the years was in allowing the bias to fully hang out before construction. She frequently weighted bias sections by hanging weights at intervals along the hem to accomplish this. I was concerned that the fabric might not hang evenly. I created a weight which distributed the weight evenly along the bottom. Take 1 inch bias tape and cut in about 18 inch lengths. Put two lengths together. Sew along the top edge. Sew along the middle. Then insert drapery weights along the bottom edge at both ends and about every 4 inches in-between. Slip a length of spiral steel boning in the bottom channel. I made 4 of these which will be enough to weight most garments. The spiral steel distributes the weight evenly. Difficult to see in the photo are silk thread tacks along the center front and back lines. This ensures that the bias stays centered on the form. Don’t be surprised when the right and left sides stretch differently and you wind up with a 3/4 inch seam on one side and 1/2 inch on the other. This is because the warp and weft threads have different tensions. Remember, couture sewing focuses on the stitching line, not the cut edge. After your fabric has had a chance to stretch, baste the side seams and remove from the form. I used narrow French seams. 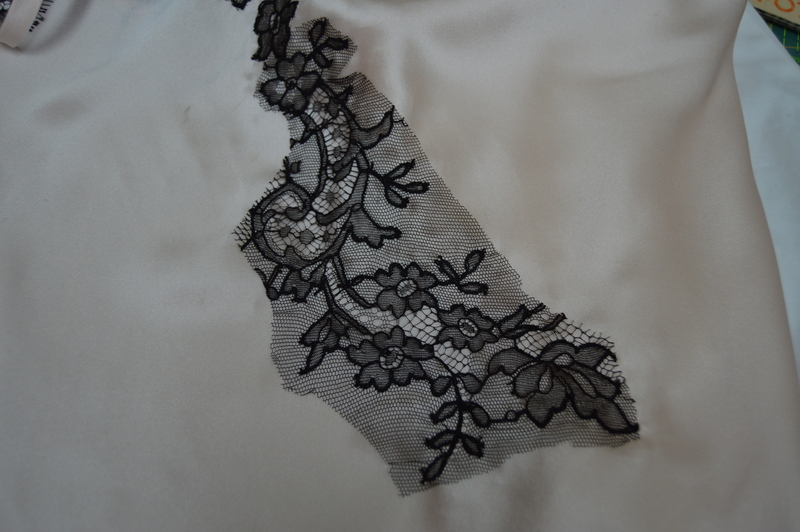 Now the fun of embellishing with lace. I cut around the scalloped hem and medallions, allowing extra fabric. Stitching the lace is done with a zig-zag stitch, about 1.4mm wide and 0.8 mm long. I tried two methods. One is using the Bernina BSR foot which allows you to move the fabric in any direction since the feed dogs are lowered. You can also use any free motion technique. I also tried leaving the feed dogs up and stitching with an open toe foot. All methods worked well, so choose the one you are comfortable with. Trim the excess netting after stitching is completed. Dovo lace scissors have a nub on one blade and are wonderful for this. They allow you to slip the scissors under the lace without snagging. 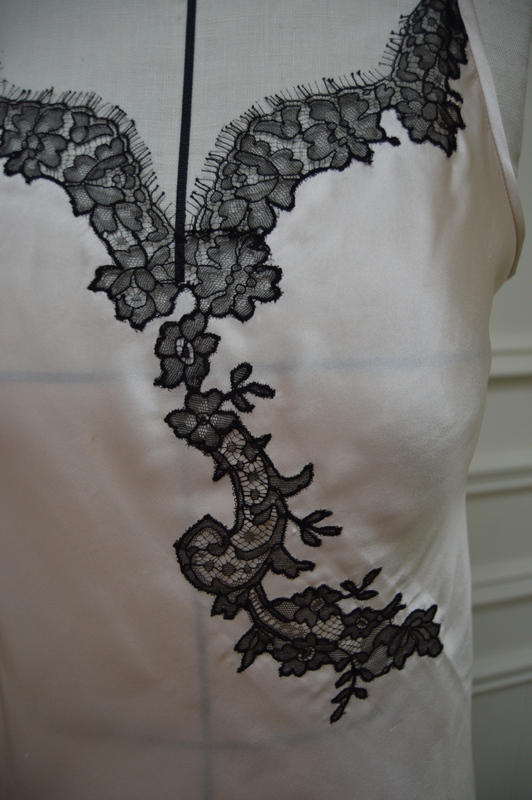 Notice how the lace pattern is mirrored at the neck line. I noticed this detail on most of the designs. Luxury at a fraction of the cost! Absolutely beautiful, I love the little detail in the back. I bet it feels wonderful to wear. Thanks. I loved playing with the lace patterns and designing motifs. Gorgeous! I didn’t know about the use of weights to help set the bias. Great idea. The use of weights is one of the little known gems of couture technique. So beautiful and dreamy! Almost too pretty to hide under a dress or wear to bed! Thank you. I’m playing with more lingerie designs. You never cease to amaze me, Mary! Absolutely stunning! Thanks. I had fun sewing this. Absolutely beautiful. I have made several items in silk charmeuse and cannot thank you enough for the weighting tip……………I had just let the garment hang for a couple of days, but I like the precision of your technique so much better. Could you tell us what pattern you used for this beautiful chemise? Gorgeous detailing at the back. Adore the attention to detail. Thank you. I used Vogue 9015, view C. I eliminated the center back seam and changed the grain lines to bias. Bias strips of the silk were used to finish back and armhole edges. Thank you so much for the extra details, really kind of you. Thank you. Almost anything can be elevated to couture level. This is so beautiful! Thank you for all the couture sewing tips! Glad you found some useful info. Thanks for the compliment. This is such a sublime piece of lingerie – marvellous work. My mother had two or three really amazing items made like this – on the bias with lace applied and cut away. French Knickers and Camisoles. One set in bright turquoise with white. I keep them as inspiration. Thanks. My next project is a shorter chemise and tap pants. Hope to get it done and posted soon. Your work is absolutely beautiful! I have just started to take my sewing projects up a few notches, and will need to make proper undergarments for underlined dresses. I will keep your post in my favorites! Thank you for sharing! Your idea of working with this kind of drapery weights is great! I have used fabric covered sausage beads before, for stretching out light fabric. 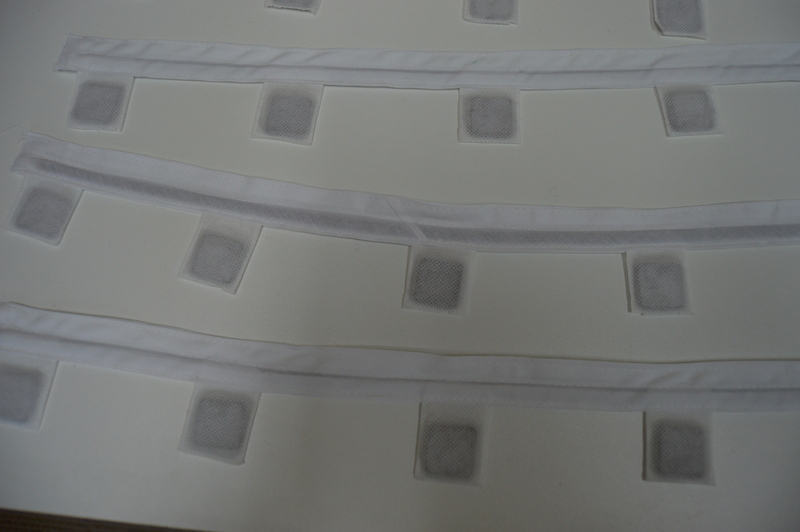 The beads are already evenly spread out in the fabric casing. They can be purchased on a roll of several yards, which makes them so much easier to reuse on any lenghth of hem. I have also used the sausage weights. I cut 3-4 lengths and fold them inside 2 inch wide bias fabric strips. They make a great weight for hanging out bias hems. Glad you enjoyed. Your garment is beautiful, couture indeed and so feminine. How wide did you cut your bias strips for the arms / what is their finished width? The proportion if perfect. The finished strap is 3/8 inch wide. I cut them 4 times finished width so 1.5 inches wide. Thank you. This is beautiful! I am looking forward to your post about the chemise and tap pants you are working on! I am fairly new to sewing and was wondering if you could explain more about the weighting process. Do you mark the original stitch line before stretching it out, and then still stitch on that original line? Or do you go back to the pattern and recut the shape and make a new stitch line after stretching? I have tried to read up on it but many sources handle the weighting differently – some sew all the side seams and just weight before hemming. The Kirk book seems to say that Vionnet basted a grid onto the fabric, then folded it in half and weighted it before cutting. It’s a lot for a beginner to make sense of! Betty Kirk’s book is probably the definitive work on Vionnet and you can learn much from studying the techniques she explains. 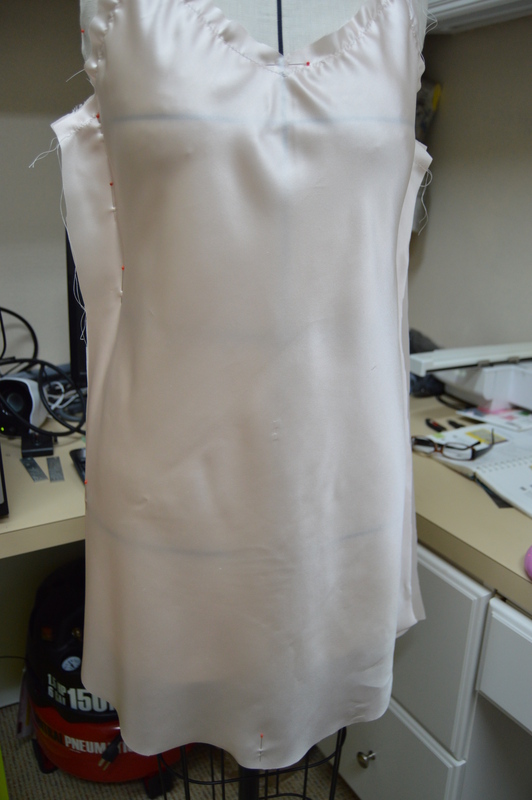 I find the easiest way to approach bias draping is to work on a mannequin which has been padded to duplicate my shape. I have a detailed post explaining how to construct such a form. If you work from a pattern, change the grain lines to bias and cut out your garment leaving generous seam allowances. Bias will increase in length but decrease in width so I leave about two inch side seam allowances. I pin the sections to the dress form and weight the hem. 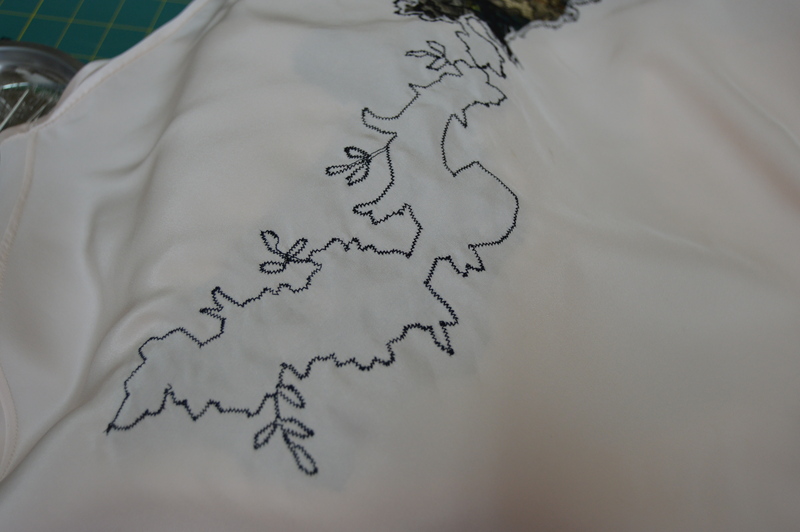 Seam lines are determined after the fabric has stretched. The original seam lines on the pattern are not used. 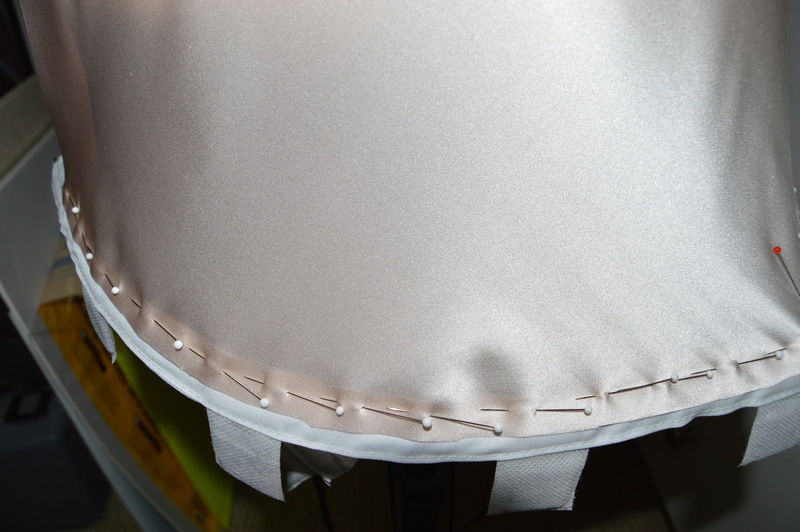 You could lay the garment pieces flat and remark seam lines but I find it easier just to drape. If a garment is cut with no center front of back seam the right and left sides will stretch differently. This is because of the way fabric is woven. The warp threads (lengthwise) are under greater tension and will stretch less than the weft threads (crosswise). If you sew the seams and weight before hemming, chances are that your seams will pucker because of that uneven stretching of the bias grain. I actually baste the seams while the fabric is draped on the dress form to eliminate any chance of seam puckering. Working with a bias cut is more difficult than straight grain sewing. Tightly woven fabrics distort less than loosely woven ones but the beauty of bias is the soft draping it produces. Good luck with your projects and please let me know if you need clarification of anything. Thank you so much, this is really helpful! I will start this project soon and will keep you posted on how it goes!